BACKGROUND AND PURPOSE: With its highly variable clinical presentation, the diagnosis of cerebral venous sinus thrombosis (SVT), and especially of deep venous thrombosis (DVT), as rare but important causes of stroke is challenging. Because noncontrast cranial CT (NCCT) is still the imaging technique of choice in most emergency departments, we aimed to investigate its value in the diagnosis of SVT and DVT. MATERIALS AND METHODS: Screening our patient data base, we identified 8 patients with DVT and 25 patients with SVT. We also included a control group of 36 patients who had presented with clinical signs of DVT or SVT but in whom thrombosis was subsequently excluded. MR imaging, multidetector row CT angiography (MDCTA), and/or digital subtraction angiography (DSA) were used as the reference standard. Three independent readers assessed the NCCTs for the presence of direct and indirect signs of DVT or SVT. Direct signs included the presence of hyperattenuated sinuses (ie, cord sign) or veins (ie, attenuated vein sign), whereas parenchymal edema and hemorrhage were indirect signs. RESULTS: The sensitivity and specificity of the attenuated vein sign for the diagnosis of DVT were 100%, and 99.4%, respectively, whereas the sensitivity and specificity of the cord sign for SVT were 64.6% and 97.2%, respectively. The sensitivity and specificity values of NCCT were 93.7% and 98% for intracerebral edema and 94.8% and 98.7% for intracerebral hemorrhages, respectively. CONCLUSIONS: Although NCCT is insufficient to exclude a SVT, its value in the emergency diagnosis of DVT seems to be very high. Former studies found the sensitivity and specificity of the cord sign for SVT to be rather low.17,24 To our knowledge, there are neither recent studies on this issue, which had been performed by using modern multidetector row CT scanners in patients with SVT, nor any systematic studies on the diagnostic value of the attenuated vein sign in DVT. Therefore, the aim of this study was to assess the sensitivity and specificity of NCCT in the diagnosis of DVT and to compare it with its value in the diagnosis of SVT. Our institutional review board approved this study, and we performed our study in accordance with the Declaration of Helsinki. Here, we defined SVT as a thrombosis of the venous sinuses with or without involvement of cortical veins, but without involvement of the straight sinus (SS) or the deep cerebral veins (ie, ICVs, great vein of Galen [VG], BVR, and thalamostriate veins [TSV]). On the contrary, DVT was defined as a thrombotic occlusion of the above-mentioned deep cerebral veins, either isolated (IDVT; ie, without an involvement of the sagittal, transverse, or sigmoid sinus or cortical veins) or combined (CDVT; ie, with involvement of venous sinuses or cortical veins). Note that the SS was classified as belonging to the deep cerebral venous system. We used our electronic in-hospital data base of clinical records to search for the key words deep, venous, sinus, cerebral, and thrombosis to identify all patients with DVT or SVT who were admitted to our institution between 2002 and 2007. Availability of at least 1 of the following additional imaging modalities: 1) MR imaging including a T2*-weighted sequence and a venous MR angiography (vMRA) or 2) MDCTA. The presence of an isolated thrombosis of cortical veins without sinus involvement was an exclusion criterion. Eight patients with DVT (5 with IDVT, 3 with CDVT; 6 women; mean age, 38.9 years; age range, 27–49 years; Table 1) and 25 patients with SVT (18 women; mean age, 43.5 years; age range, 18–82 years; Table 2) matched the criteria and were included. Data on the clinical presentation of 3 of the patients with DVT have been previously published,28 but imaging data have not been reported in a similar fashion. In addition, we included 36 consecutive patients (22 women; mean age, 41.2 years; age range, 25–73 years) who initially presented with clinical symptoms of DVT or SVT and who had undergone an NCCT but in which all other imaging modalities showed no pathologic findings and clinical follow-up was uneventful (control group). The patients from the control group also had to meet the above-mentioned inclusion criteria. NCCT had been performed in all patients included in the study (n = 69). MR imaging including vMRA and a T2*-weighted sequence was available in all patients with DVT, in 23 patients with SVT, and in 18 patients of the control group. MDCTA had been performed in 6 patients with DVT, 19 patients with SVT, and 26 patients from the control group. In addition, DSA was available in 4 patients with DVT, 7 patients with SVT, and 5 patients from the control group (Tables 1–3). NCCT and MDCTA were conducted on a 4-detector row CT (Aquilion; Toshiba, Neuss, Germany). NCCTs were performed with 120 kV, 300 mAs, a collimation of 2.5 mm, a section width of 5 mm, and a reconstruction increment of 5 mm. For the MDCTA, the following parameters were used: 120 kV, 120 to 140 mAs; collimation, 4 × 1.0 mm; 120-mL contrast agent with an iodine concentration of 300 mg/mL; injection rate, 5 mL/s, and delay, 35 s.
MR imaging was performed on 1.5T scanners (Magnetom Vision or Symphony; Siemens, Erlangen, Germany). The following sequences were available: 1) DWI-sequence with b-values of 0 and 1000, and 3 gradient directions (TR, 4200 ms; TE, 139 ms; section thickness, 5 mm; FOV, 210 mm; matrix size, 128; gap spacing, 30%; 2 signal intensity averages, 23 sections); 2) proton attenuation- and T2-weighted SE-sequence, acquired as a dual-echo acquisition (TR, 2210 ms; TE, 85/14 ms; section thickness, 6 mm; FOV, 210 mm; matrix size, 256; gap spacing, 30%; 1 signal intensity average, 23 sections); 3) T1-weighted SE-sequence (TR, 665 ms; TE, 14 ms; section thickness, 6 mm; FOV, 210 mm; matrix size, 256; gap spacing, 30%; 1 signal intensity average, 23 sections); 4) T2*-weighted gradient-echo sequence (TR, 1000 ms; TE, 22 ms; section thickness, 5 mm; FOV, 210 mm; matrix size, 256; gap spacing, 30%; 1 signal intensity average, 19 sections); 5) fluid-attenuated inversion recovery (FLAIR) sequence (TR, 7500 ms; TE, 74 ms; TI, 2500 ms; section thickness, 5 mm; FOV, 220 mm; matrix size, 256; gap spacing, 30%; 1 signal intensity average, 19 sections); and 6) venous 2D-time of flight MR angiography with arterial saturation pulses (TR, 24 ms; TE, 5.6 ms; flip angle, 50°; section thickness, 3 mm; FOV, 210 mm; matrix size, 256; gap spacing, −10%; 1 signal intensity average, 50 sections). DSA was performed on a biplanar DSA unit (Neurostar; Siemens) including selective catheterizations of both internal carotid arteries and the dominant vertebral artery, late venous phases, and oblique projections to better analyze the venous and sinus structures. In total, 69 NCCT scans were analyzed independently by 3 experienced neuroradiologists, who were blinded to the clinical data and patient identification information. Image interpretation was performed on a standard PACS workstation. Reading orders were randomized, and standardized evaluation forms were used. The readers evaluated the NCCTs for the presence or absence of hyperattenuated sinuses (ie, cord sign) or cerebral veins (ie, attenuated vein sign). The following venous structures were evaluated in the listed sequence: superior sagittal sinus (SSS), inferior sagittal sinus (ISS), right and left transverse sinuses (RTS and LTS), right and left sigmoid sinuses, SS, right and left ICVs, VG, right and left BVR, and right and left TSVs. If readers classified a sinus or vein as hyperattenuated, they documented the mean attenuation of the respective venous structure in Hounsfield units (HU). The HU of veins or sinuses that were not classified as hyperattenuated were not noted because these venous structures could not, in all cases, be reliably differentiated from surrounding brain parenchyma on NCCT. Readers had to decide whether they interpreted the presence of a hyperattenuated vein or sinus as indicative of an SVT or a DVT. Whenever a thrombosis was suspected, the involved venous structures and the presence of intracerebral edema or hemorrhage were noted. The diagnostic confidence regarding the presence or absence of a DVT or SVT was rated on a 5-point scale (1, absolutely certain; 2, very certain; 3, certain; 4, not very certain; 5, uncertain). After having evaluated all NCCT datasets, readers performed a consensus reading to obtain a reference standard. They collaboratively reviewed all available imaging modalities including follow-ups of any respective patient. Furthermore, readers studied the clinical records to take the clinical and outcome information into account. 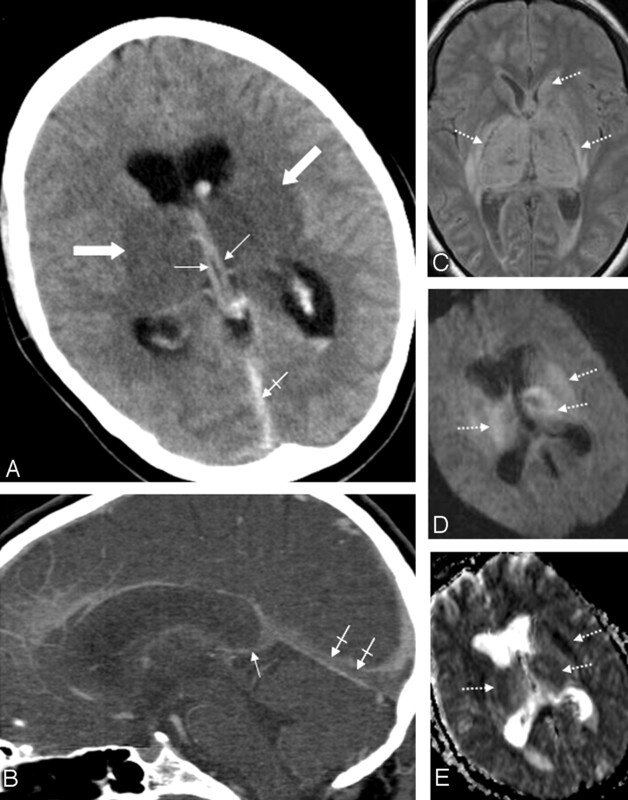 They subsequently determined, in consensus, 1) the overall presence of a DVT or a SVT; 2) if applicable, the extent of the respective thrombosis, (ie, the involvement of the individual veins and sinuses); 3) the presence of an intracerebral edema; or 4) intracerebral hemorrhage or hemorrhagic transformation of a venous infarction. If there were any discrepant findings between the different modalities, the reference standard was based on the results of the T2*-weighted images and the source images of the vMRA, if applicable.18 In cases in which no MR imaging was available, this evaluation was done on the basis of MDCTA.19,20 Whenever DSA was available, it was additionally evaluated. With regard to intracerebral edema and hemorrhage, proton attenuation/T2-weighted, FLAIR (for edema), and T2*-weighted images (for hemorrhage) were given precedence if available. In the remaining cases in which only NCCT and MDCTA had been performed, follow-up NCCTs were available and were reviewed together with the initial NCCT during the consensus reading to determine whether edema or hemorrhage was present. All available data were entered into a data base and were analyzed with standard software (Excel and Access; Microsoft, Redmond, Wash). Sensitivity and specificity parameters of the attenuated vein sign and the cord sign for the diagnosis of DVT and SVT, respectively, as well as their respective 95% confidence intervals, were calculated. We calculated and compared the mean attenuation values (HU) of the hyperattenuated sinuses and the hyperattenuated veins using the Student t test. We assessed hematocrit values via the clinical records and performed comparisons between the mean values of the following different patient subgroups using the Student t test: all men (n = 23), all women (n = 46), men with DVT (n = 2), men with SVT (n = 7), male control subjects (n = 14), men with cord sign (n = 14), men with attenuated vein sign (n = 2), men without hyperattenuated veins or sinuses (n = 7), women with DVT (n = 6), women with SVT (n = 18), female control subjects (n = 22), women with cord sign (n = 25), women with attenuated vein sign (n = 7), and women without hyperattenuated veins or sinuses (n = 14). The most common clinical symptoms in patients with DVT were headache (n = 7), confusion (n = 3), reduction of vigilance (n = 3), paresis of variable degree (n = 2), and loss of consciousness (n = 2). D-dimer values were elevated (> 0.5 ng/mL) in 6 patients (mean, 6.4 ng/mL; range, 0.7–30.3 ng/mL) and were within normal limits (< 0.5 ng/mL) in 2. The mean interval (ie, diagnostic delay) from initial symptom onset to the definite diagnosis of DVT was 10.9 days in the patients with DVT (Table 1). Regarding the mean hematocrit values, there were no significant differences between the different patient subgroups. The P values ranged from 0.068 (“all men” vs “all women”) to 1 (“men with cord sign” vs “men without hyperattenuated veins or sinuses”). In total, 207 readings were performed, and 2898 venous structures (ie, 1242 sinuses and 1656 veins) were evaluated by each reader, resulting in a total of 8694 single assessments. A cord sign was found in 116 sinuses and an attenuated vein sign in 138 veins. The results of the consensus reading regarding the patients with DVT are detailed in Table 4. In detail, the readers noted the venous sinuses and the deep cerebral veins as hyperattenuated in the following percentages of cases: the SSS in 21.7%, the ISS in 3.9%, the TS in 9.7% and 8.7% (right and left side, respectively), the sigmoid sinuses in 5.3% and 6.8% (right and left side, respectively), the VG in 11.6%, the BVR in 6.8% and 5.3% (right and left side, respectively), both ICVs in 11.6%, and the TSV in 4.3% and 6.3% (right and left side, respectively; Tables 4 and 5). The mean attenuation of the hyperattenuated sinuses and veins was measured as 62.3 ± 8 HU and 57.8 ± 18 HU, respectively. A DVT was diagnosed by the readers in 13.5% (28/207 readings; Fig 1) and a SVT in 27.1% of patients (56/207 readings; Fig 2). There was 1 false-positive diagnosis of a CDVT in a 20-year-old male patient with SVT of the SSS. In contrast, there were 28 false-negative and 5 false-positive diagnoses of SVT (Fig 2). Thus, the sensitivity of the attenuated vein sign for the presence of DVT (isolated or combined) was 100%, whereas its specificity was 99.4%. In contrast, the sensitivity and specificity of the cord sign for the diagnosis of SVT (without involvement of the deep cerebral veins) were 64.6% and 97.2%, respectively. Patient 5. A 31-year-old woman with combined deep cerebral venous thrombosis of the TSV, the ICVs, the BVR, the VG, the SS, and the LTS. A, The NCCT scan demonstrates an attenuated vein sign in both ICVs (thin arrows), in the SS (crossed arrow) as well as bilateral edema in the thalami and in the putamen (thick arrows). B, Multiplanar sagittal reconstruction of an MDCTA. The thrombosis is visualized indirectly by demonstration of contrast-filling defects in the ICVs (thin arrow) and the SS (crossed arrows). C, An axial proton-attenuation-weighted MR image (acquired as a dual-echo acquisition) also depicts the bilateral edema in the thalamus and the putamen as well as edema in the left caudate nucleus as hyperintense areas (dotted arrows). D, Diffusion-weighted image (b-value = 1000) and the apparent diffusion coefficient map (E) show a restriction of diffusion in the respective areas (dotted arrows). Examples for true-positive, false-positive, and false-negative cord signs in the evaluation of sinus thrombosis. A, A 35-year-old woman with an SVT of the SSS and the RTS, who presented with headache and nausea. The NCCT scan shows a true-positive cord sign in the SSS (dotted arrow) and the RTS (arrows). The case of this patient was judged as positive with regard to the presence of a cord sign by all 3 readers. B, A 27-year-old woman in the control group, who initially presented with headache, but all other available imaging modalities showed no pathologic findings and clinical follow-up was uneventful. The RTS appeared hyperattenuated on NCCT (arrows). This finding was interpreted as a cord sign by all readers, resulting in the false-positive diagnosis of a SVT in this patient. C and D, A 45-year old woman with headache and nausea and a SVT involving the RTS and the SSS. The NCCT scan (C) shows no hyperattenuated signal intensity (ie, no cord sign) in the RTS or the SSS: The case of this patient was judged as false-negative regarding the presence of a cord sign by all readers. D, Multiplanar sagittal reconstruction of a MDCTA demonstrates contrast-filling defects in the RTS (arrow) and in the SSS (dotted arrow), indicating an SVT. Tables 4 and 5 summarize the results of the readers’ evaluation regarding the extent of the DVT or SVT (ie, regarding the veins and sinuses involved, including false-positive and false-negative results). Concerning the individual venous structures, the attenuated vein sign showed a sensitivity and specificity of 93.5% and 99.4%, respectively, for correct detection of the individually affected deep cerebral veins, whereas the cord sign showed sensitivity and specificity values of 33.9% and 95%, respectively, for the sinuses. The 95% confidence intervals of both patient groups did not overlap (Tables 4 and 5). NCCT detected intracerebral edema with a sensitivity of 93.7% and a specificity of 98%, respectively, and hemorrhage or hemorrhagic transformations with a sensitivity and specificity of 94.8% and 98.7%, respectively. The mean diagnostic confidence regarding the presence or absence of a DVT was rated as 1.1 (ie, absolutely certain), whereas it was 3.7 (ie, not very certain) for SVT. The interobserver agreement for the presence of an attenuated vein sign was 0.958 (κ range for individual veins, 0.90–0.98; Table 4) and 0.80 for the cord sign (κ range for individual sinuses, 0.70–0.84; Table 5). Because prompt therapy of cerebral venous thrombosis has a great impact on clinical outcome, early diagnosis is essential, especially in patients with involvement of the deep cerebral veins.14,17 The diagnosis is still often made with considerable delay, which is also reflected by the mean interval from symptom onset to diagnosis in our patients with DVT. One of the main factors contributing to this delay is the marked variability of the clinical presentation.13,14 In our series, no single symptom or sign was present in all of our patients with DVT. In addition, laboratory tests seem less useful in the diagnosis of DVT. Normal D-dimer levels have been shown to have a high negative predictive value in patients with suspected cerebral venous occlusive disease.1 However, we found levels to be within normal limits in 2 of our 8 patients with DVT. This finding might be related to the relatively small thrombus volume in patients with IDVT. These results suggest that D-dimer is of limited value in the exclusion of DVT, further emphasizing the importance of imaging. Using a blinded-reader approach and a control group of patients without any pathologic conditions of the cerebral venous system, we clearly demonstrated that the attenuated vein sign in DVT, as a direct NCCT sign, is much more sensitive and specific than the cord sign in SVT. Although the sensitivity of the cord sign for SVT in our study was slightly higher than previously reported in older studies (25%–56%),24,26 it was, nevertheless, much too low (64.6%) to allow the use of NCCT in excluding an SVT. With regard to DVT, an attenuated vein sign has been described in several case reports,13,30–33 but its diagnostic value has never been assessed systematically. Here, we demonstrated that NCCT is very helpful in the diagnosis of DVT, as the attenuated vein sign shows both a high sensitivity and a high specificity for DVT. The interobserver agreement for the presence of an attenuated vein sign was excellent for all veins, and it was good to excellent for the presence of a cord sign for all sinuses. Nevertheless, the diagnostic confidence for the diagnosis of DVT was higher than for SVT. In our study, NCCT in patients with DVT or SVT and in patients from the control group had been performed under exactly the same conditions. This provides evidence that the observed value of NCCT in the diagnosis of DVT compared with SVT does not result from the improvement in NCCT imaging quality compared with older studies24,26 but is rather the result of other factors. One possible reason for the different findings in DVT compared with SVT is that the deep cerebral veins are much less prone to partial volume effects compared with the venous sinuses. The sinuses are located in the immediate vicinity to the skull. Thus, partial volume effects can result in a false-positive cord sign.34 Another potential pitfall might be that flowing venous blood can also appear mildly hyperattenuated, probably because of high hematocrit values.25,35 This mechanism might have been the case in the 20-year-old patient with SVT in our study, who presented with a hematocrit level of 0.49 and in whom involvement of the deep cerebral veins was wrongly diagnosed by 1 of the readers. A possible explanation for false-negative hyperattenuated sinuses in SVT might be the less severe clinical presentation of an isolated thrombosis of 1 sinus (eg, the transverse sinus) compared with DVT. If imaging is not performed immediately after onset of symptoms but with a considerable delay because symptoms are unspecific and are less severe, the thrombus might already be isoattenuated, resulting in false-negative imaging findings. As the hematocrit values did not differ significantly between the patients with SVT, patients with DVT, and patients from the control group, they cannot account for the different findings in patients with DVT compared with those with SVT. On the basis of our findings, we hypothesize that the hyperattenuation of the thrombotic material found in patients with DVT might result in false-negative results on contrast-enhanced CT studies (or even on CT angiography) because the hyperattenuated thrombus might mimic flow in thrombosed deep cerebral veins. Because systematic studies on this topic are not available to date, we strongly recommend the performance of an NCCT scan as the first step in every case of suspected venous thrombosis. 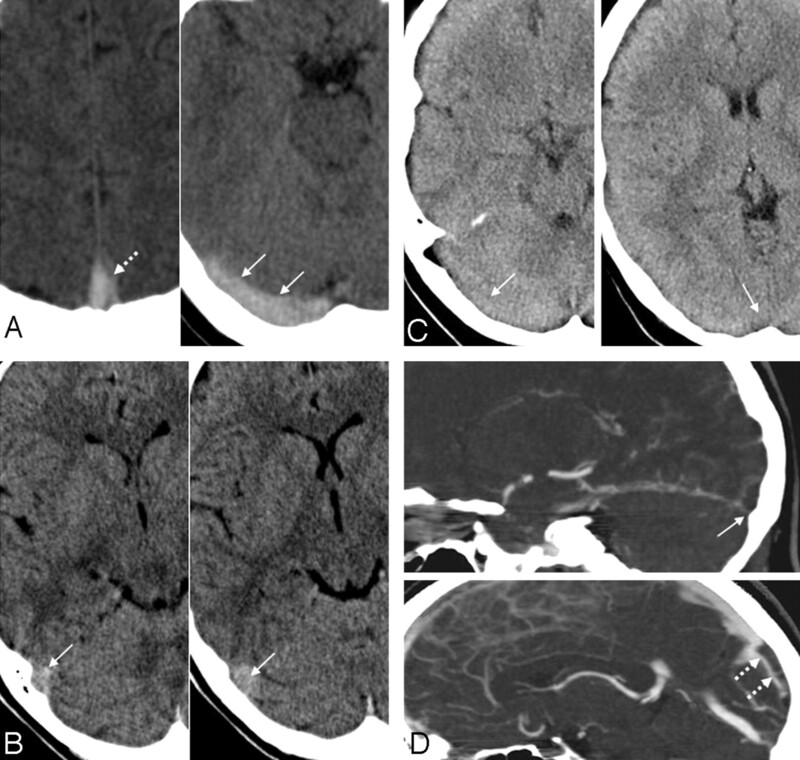 Although parenchymal changes are seen more readily on MR imaging than on CT,17,19,34 NCCTs showed high sensitivity and specificity values for the detection of intracerebral edema (93.7% and 98%, respectively) and hemorrhage (94.8% and 98.7%, respectively) as thrombosis sequelae. In addition, the sample size of our study was relatively small. However, DVT is a rare disease, rendering the recruitment of large patient populations difficult. Because the 8 patients with DVT were assessed by a blinded, multiple-reader approach, this shortcoming may not necessarily limit the scope of our observations. Our study revealed a high sensitivity and specificity of the attenuated vein sign for the diagnosis of DVT, which was not true for SVT. Thus, the value of NCCT in the emergency department diagnosis of DVT is very high compared with its value in patients with SVT. If an attenuated vein sign or a cord sign is present, the suspicion of a DVT or SVT should be high, and a venous CTA should be performed immediately to confirm the diagnosis. The absence of an attenuated vein sign (and any hemorrhage or edema) makes a DVT very unlikely. The absence of a cord sign does not exclude an SVT. Thus, venous CTA must be performed in addition to NCCT if SVT is suspected clinically. We thank Mrs. V. Schop̈f for reviewing the statistics. Previously presented in part at: 93rd Annual Assembly and Scientific Meeting of the Radiological Society of North America, November 30, 2007, Chicago, Ill. Accepted after revision November 11, 2008.